There are times when you’re drawn to an image in the making. Searching to find it is one thing. Stopping to see it is another. Waiting to feel it is something different. Being there long enough is everything. I love getting back to my roots in photography and for me that’s film..B& W, and with a larger format than 35mm…this case my Blad…man do I love that camera for this. Something about looking down into that square. I once read from another photographer , can’t remember who though. He said that a square somehow makes the statement that a photographer was here and deliberately made this frame , as is. For me it’s a Zen moment, much needed in the world of pixels and workflows. So here I was with a group of all kinds of photographers simply loving to do what they do. They chose the Gold Coast Train Museum in Miami,Fl to spend the day. MMM..still lifes=Blad!! Somewhere along the way, I stepped back into a time when train travel was prevalent. I remembered when I was a child living in New York and leaving for Tampa,Fl. by train to visit my grandmother, a 24 hour ride clickedy-clackedy all the way, basically sitting up..ah a time to relax between each screeching stop at the next major station..”those were the days” right? ok so all aboard!! 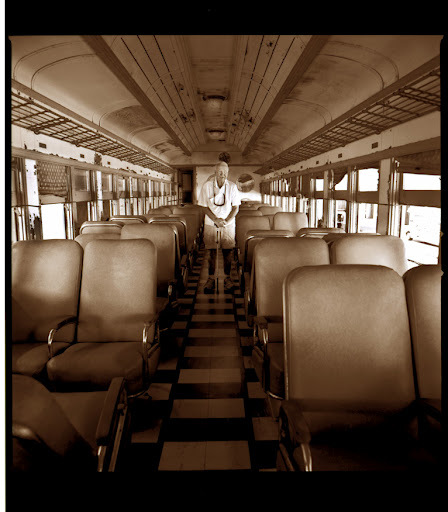 I spent a few hours shooting the exteriors of the trains deep in my Blad and into a time gone by. Somewhere during the day,needing a sun break, I stepped inside a car and back to my childhood sitting in one of those seats..summer vacation,out of the city,.. I set up the Blad on the tripod and took my time framing the scene, I thought I found the right moment..As I bent down to focus an older gentlemen came in tapping his cane..followed by his younger granddaughter..She sat down to duck..he asked..
” Am I in the picture?” I raised my head slowly, as though to receive communion …”You are the picture” .. I asked his granddaughter to come forward ( out of the frame ) and asked the gentleman to just stay where he was and remember his travels in this car, typical of many others from that era, he did… and strike a pose, cane in hand . He was off to a time past and I was on my way back to visiting Tampa at 5 years old again..CaChunk..CaChunk…two frames, back to reality from a moment in time. There are many moments that we find when we take the time to connect and once in while if we just take a little more time, a better moment finds us. It’s an afterglow that we don’t see, in this hurried world, unless we stay in the moment long enough to see it. While it doesn’t always happen, when it does…like a matador’s “moment of truth” you know it and it becomes yours.